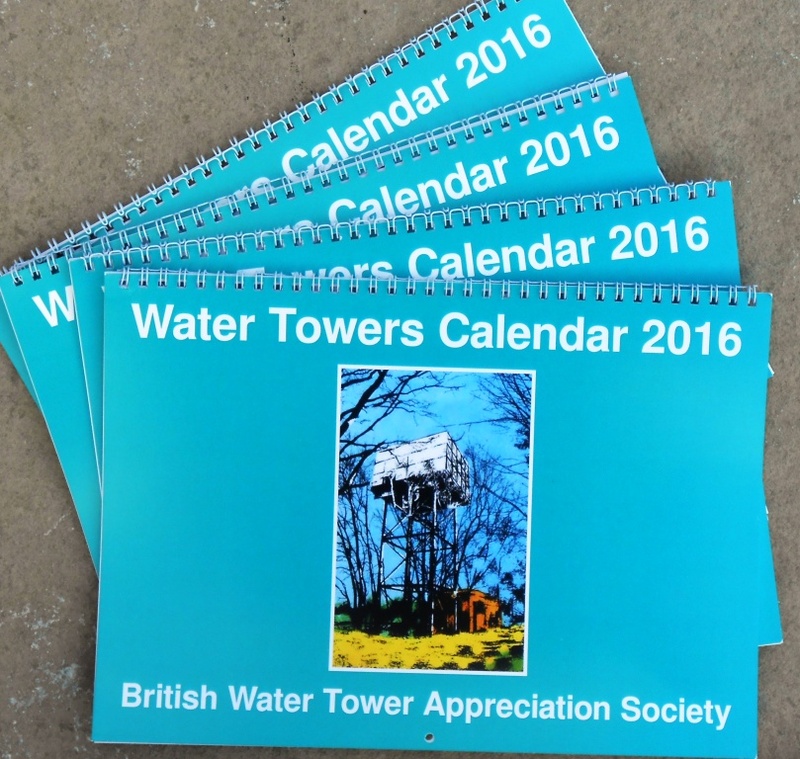 The only British society dedicated to water tower culture and history. "Onwards and Upwards"
© Mrs. M. Barton — not Dr. B. Barton as credited within. Another Christmas present idea is “Water Towers of Britain” — the definitive book on UK water towers, by Society President, Dr. Barry Barton. This 240 page book (synopsis) is available for only £7·50 + £2·50 p&p, orders with cheque made out to BWTAS please, to BWTAS, Green Gables, The Street, Wenhaston, Suffolk IP19 9DP. Should you not have a cheque book, you may pay by bank transfer — please email BWTAS: bwtas@hotmail.co.uk for details… We can also do bulk orders of calendars — four calendars can ship in the UK for £2·00, a book and a calendar for £3·00 in the UK, £7.65 to rest of Europe. I don't have a check book, is there another way of paying? 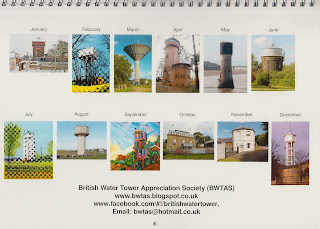 We currently have the new BWTAS mugs for sale at a competitive £5·00 + £2·50 p&p, see here. 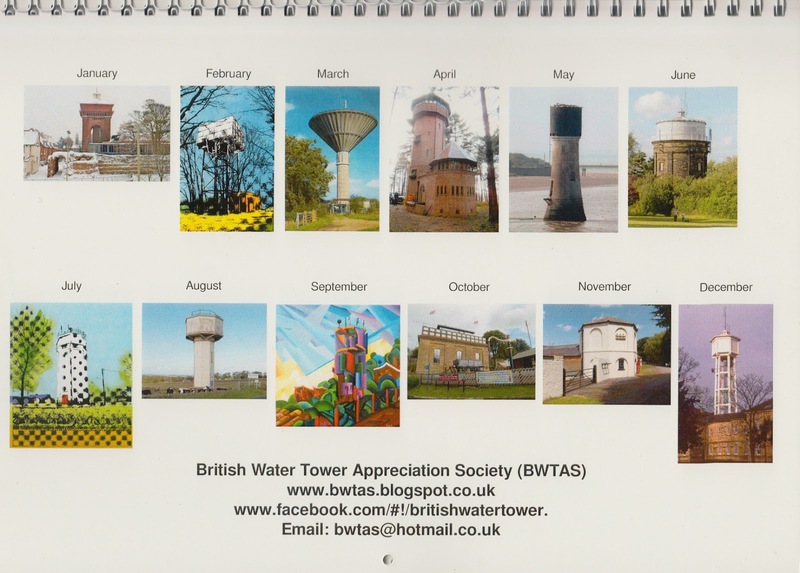 We also, still have copies of the BWTAS 2016 Calendar for sale, now at a reduced £2·00 + £1·50 p&p, see here and also currently in stock: Barry Barton's ‘Water Towers of Britain’ - the Water Tower enthusiast’s ‘bible’ available for an incredibly low price of only £7·50 + £2·50 p&p. All other BWTAS merchandise has now sold out! All our 2012 calendars, original mugs, T-shirts have all gone. If you've got some, it's now highly sought after! BWTAS will again team up with the Balkern Tower Trust and have a joint stand at the Essex Industrial Heritage Fair, on 7th October at Wat Tyler Country Park, SS16 4UH. If you have an idea for an event, or would like to organise one, please contact us here. The British Water Tower Appreciation Society exists to connect enthusiasts of water towers to share their enjoyment of their artistic, cultural, architectural, historical, social and engineering significance. For information about joining etc. see the first introduction posting here.